For the past couple of months, I’ve been dropping hints about my next big project. While Breaking a Thief is in the query process, I’ve decided to write something for readers to enjoy (potentially) before that is published. Although my latest project may not be nearly as long as a novel, it is no less ambitions because I intend to self-publish it. That aside, the mystery is over! Lately, I’ve been writing a fantasy short story series called Last of the Memory Keepers. Six 10,000-ish-word stories follow the adventures of the three apprentice Memory Keepers, Rhona, Ellard, and Finley. Told in first person from the perspectives of Rhona and Ellard, the Elders are entertaining talk of unifying the five races, and negotiations are progressing smoothly. Or are they? This series is geared towards a college-age audience (but not limited to them either!) who enjoys reading fantasy, particularly fans of The Lord of the Rings and The Chronicles of Narnia. But I wouldn’t go so far as to say I’ve attempted to copy either. You’ll find no elves, dwarves, or even—dare I say it?—dragons in this world. In my attempt to shy away from fantasy stereotypes, I’ve opted instead for five races, each with particular Gifts, magical abilities loosely based off the five wits of the Middle Ages. Below I’ve included my mission statement for these stories, much thanks to Hannah Heath for the for questions and inspiring me to answer them! 1. Why are you a writer? I’m a writer because I enjoy a well-told story that brings me alongside the characters and makes me think about life. I torture myself by staying up ‘till two in the morning because I had to know how the book ends. The written word is an art form—sometimes messy, sometimes neat—but I enjoy finding beauty in things great and small. I’d like to share stories of my own with like-minded readers because I’ve got a couple crazy ideas of my own. 2. Why are you writing this series in particular? I’m currently writing a short story series because fantasy is the genre I tend to come back to when I’m looking for a new release or something nostalgic, like The Chronicles of Narnia. 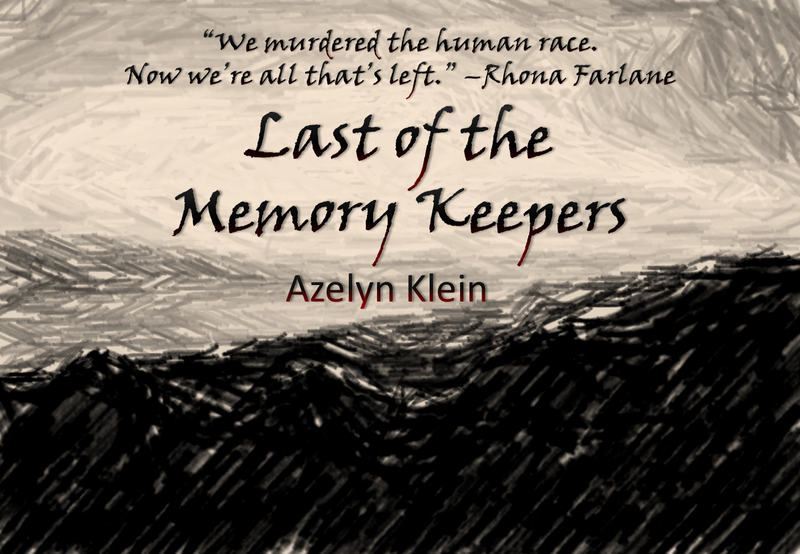 The short story series I’m working on—The Last of the Memory Keepers—fits the fantasy genre but has characteristics that would appeal to a modern audience, such as new adult protagonists, multiple races with their own Gifts, and anti-stereotypical characters. 3. Why is this series important to you? These particular stories are important to me because they explore different views of what it means to be human, from sacrificial love and betrayal to self-righteous campaigns and the naïve struggles of youth. In many societies today, some people have little regard for life and others fail to recognize the human nature of others because of racial or gender differences. While these stories do not seek to be preachy, they come from an author whose worldview reflects the value of every human life, no matter how great or small or different. 4. Why are you the one to write this series? In many ways, I can relate with some of the characters because I’ve drawn from my personal experiences. Like me, Rhona, one of the protagonists, is a daughter of multiple cultures caught between the unknowns of life. Coming from a military lifestyle and recent college experiences, I have interacted with different cultures and made and parted with many friends. Ellard, the other protagonist, has a strong desire to help his race, but to do so, he’ll have to overcome the failures of his past only to learn he can’t do it by himself. Yet each character differs from me in other ways, such as Rhona’s passion for history and Ellard’s aptitude for verbal communication. Where I lack the experience, such as with the fantastical Gifts bestowed upon the five races, I have done my best to use my imagination. So, let me know what you think! Would you be interested in reading these stories? What appeals most to you? If you’re a writer, how would you answer the above questions? I’m also looking for beta readers to help critique these stories. If you’re interested in the writing process and reading a pre-publication copy, feel free to let me know by commenting below or sending me a message on Facebook or Twitter. Please keep in mind that such a role takes time and effort (1-2 hours a week for about 1 month). Your help is greatly appreciated! Outstanding . . . thought provocative and insightful! Thanks! I have been super busy. I guess you could say I have no life outside of books and stories right now (which is about 85% true). Hopefully I'll have something published soon for other people to read. :) I grew up with Narnia too! Do you have a favorite of The Chronicles? Always a pleasure to read your posts. Thanks for the lovely comment!